PortfoLion and Fiedler Capital are assisting the international expansion of the cyber security startup with a €500 thousand investment. Using the raised funds SEON will be able to open towards new markets and industries. Tamás Kádár and Bence Jendruszák have recognized these trends early on and they didn’t hesitate to establish the company in 2017. SEON’s supercharged fraud prevention system is using Machine Learning to detect fraudulent actions, like credit card fraud, identity theft, account takeover and other abuses. The most common users of SEON’s product are high risk merchants and payment service providers. Contrary to their competitors, SEON’s product is an out-of-the-box solution, because it provides a fully transparent picture of why the surveyed users were given the certain risk classification. With the help of the investment, the Hungarian startup can concentrate on a bigger market and they can gain advantage over their US-based competitors. Digital security in all areas of the world has become a key factor. This won’t change in the future either, because cyber security will be a major priority in the economic growth of companies. In parallel the PSD2 regulations have also increased the significance of SEON’s solution and all cyber security services. During SEON’s one year of its existence the startup earned several large international clients and it could constantly extend its team. 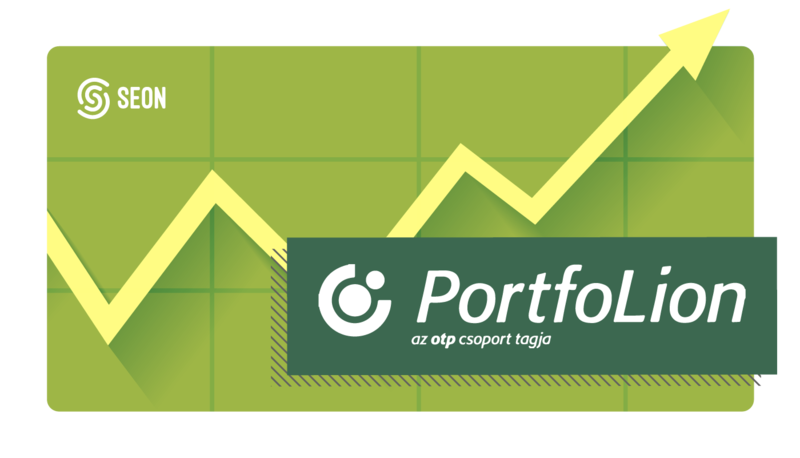 Due to these facts, PortfoLion also decided -besides the former investors- that the first investment of the OTP Digital Venture Capital Fund will be the cyber security startup. With this collaboration, thousands of companies can create a safe environment for their clients with just a few clicks. The primary investment targets of PortfoLion are early stage fintech and digital technology startups in the CEE region that have already achieved the product-market fit and seek for investment ranging between 100,000 and 1 million euros in size to validate their business model or to develop the product. The OTP Digital Fund was established in 2017 to support OTP group’s digital strategy. PortfoLion’s aim is to support the growth of enterprises in digital technology projects with significant growth potential which can become major players in the digital transformation of the European financial sector in a few years. Investment areas include e-commerce, blockchain, big data, IT infrastructure, financial software, artificial intelligence and machine learning solutions. PortfoLion’s principal motivation being significant growth in the value of the enterprises over this time. It treats the existing stakeholders or management as partners, seeking – in collaboration with them – mutual decoupling opportunities at the end of the investment. Through its four VC funds, PortfoLion provides a broad spectrum of support to the enterprises by the challenges in corporate growth and expansion. In addition to the invested capital, PortfoLion provides several opportunities to the selected business like professional knowledge, industry relations and network of the banking group which has presence in 9 countries. Fiedler Capital is a new seed and early stage venture capital firm that invests in exceptional entrepreneurs from the CEE & Baltic regions building world-changing startups. Fiedler provides cash investments up to €250,000. The CV looks into all verticals, but they have a clear preference for companies with a strong B2B aspect. Fiedler Capital particularly likes platforms, SaaS business models and data analytics. Founded in 2000, Fubra is a creative, diverse technology, publishing and investment business with strong values, a committed team and a thirst to create a new future with their partners and clients. Fubra has expanded and grown over the years taking on new challenges and leading the way in technology. Fubra has the potential to act as an incubator in a joint venture to help startups get to the next level, or alternatively as an equity investor.